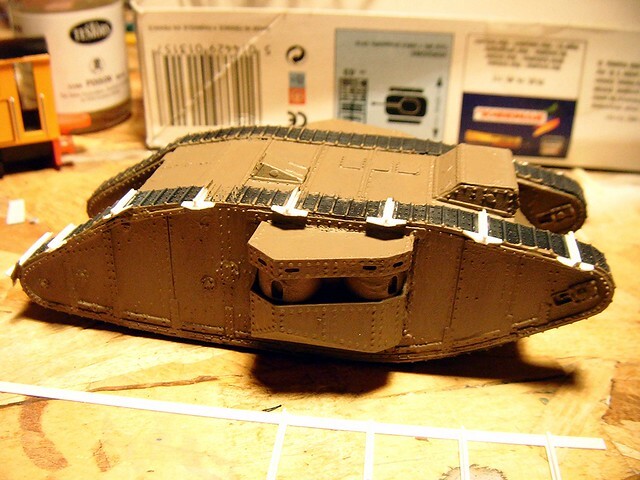 I want a Tank Mark II in 1/72 scale because a 1/76 tank model looks wrong with most of today's figures (the old, small, Airfix figures might look OK, but HaT's figures are proper 1/72 and they make the Airfix kit look small), so I'm doing a mash-up of the Emhar and Airfix kits. 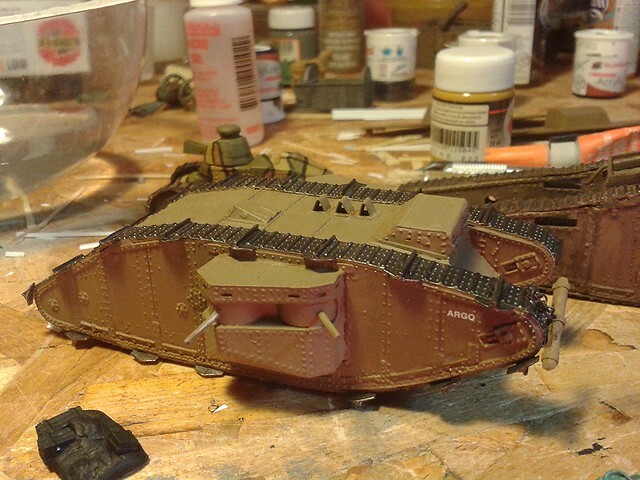 I used the cab from Airfix and the body from Emhar, with sponsons from either Airfix or Matador. After some filling, I painted the cab to show up any defects. I can still see some, but I can live with it! 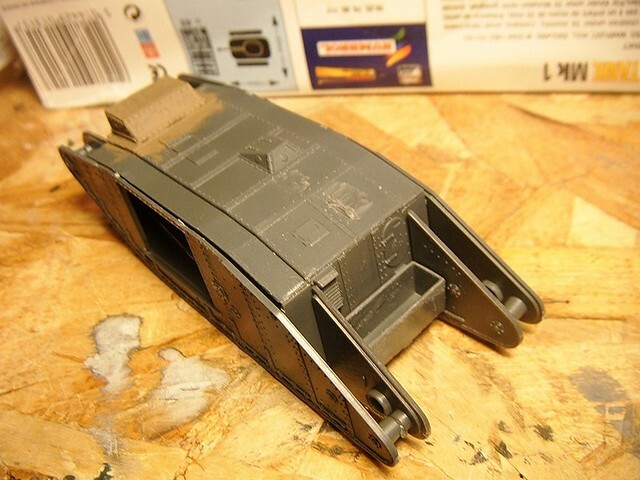 Since the above photo was taken, I have slimmed down the towing shackle in preparation for correcting it. 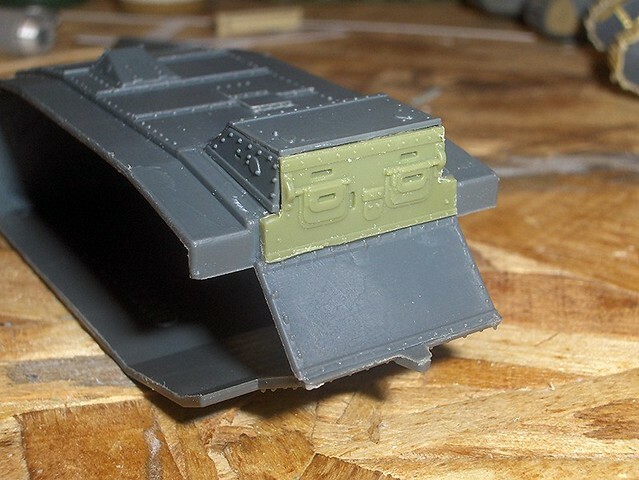 Trying to make a stowage box at the rear out of some bent up plastic strip. 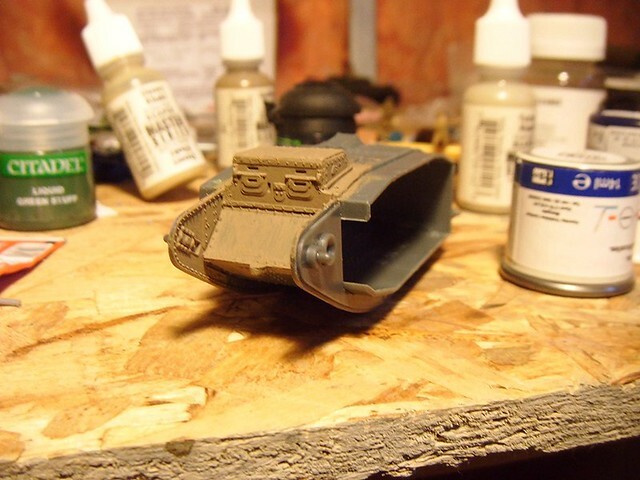 Then I realised I could use a part of the Emhar kit (the petrol tank) if I put it on upside down. As you can see, the sides are on, and there are some big gaps! 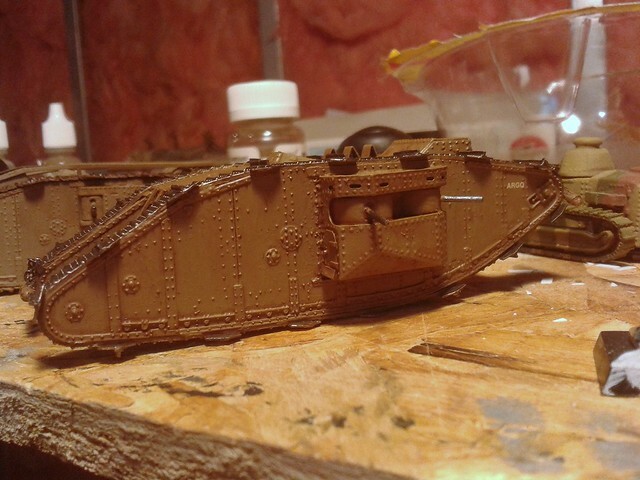 I'm not at all worried about the gaps because I will fix them when I fit the tracks - I haven't strongly attached the sides of the tank because I know from experience that this kit is hard to get perfect if you follow their instructions. 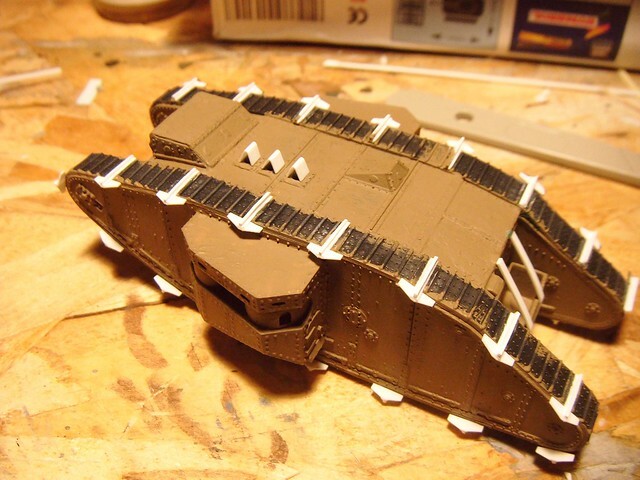 By leaving the sides only loosely fitted (with very little glue) I can jiggle them about as the tracks go on, to make the whole thing look OK-ish. 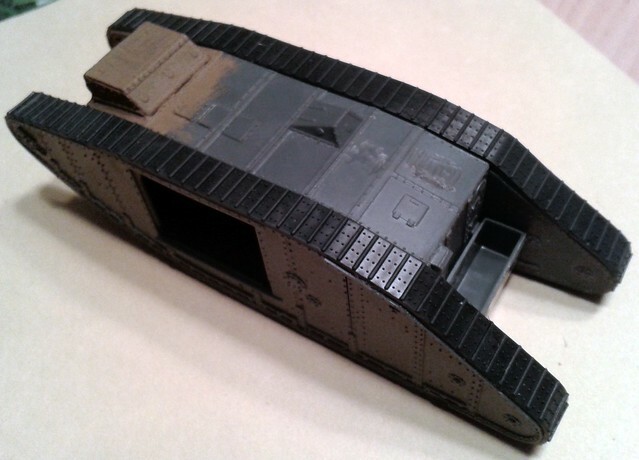 I've also hacked off a line of rivets and one of the small hatches in the rear roof and will be removing the other one. 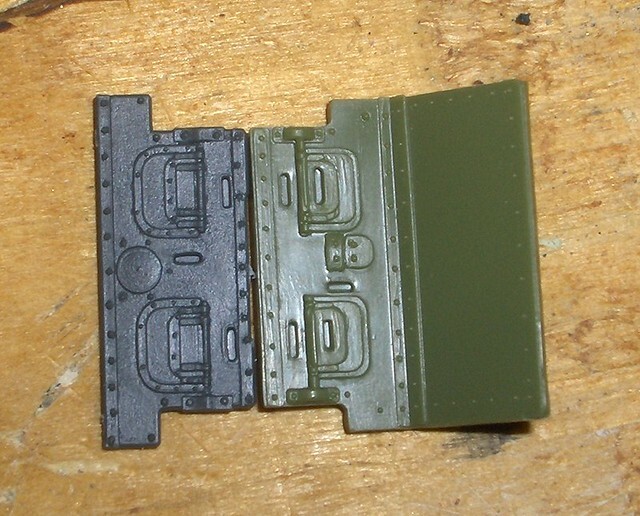 These hatches that Emhar have added are only present on the Bovington Mark IV and did not exist on the real Mark II tanks, and the fictitious line of rivets is a fashion trend that Airfix started back in the 1960s! Good start! Looking forward to the next steps! Did you vote in the 39th Competition ? Or in the April duel from Mr X? Didn't realise the deadline is next week! Eek! Got the sponsons on and, as I predicted, they are too small. 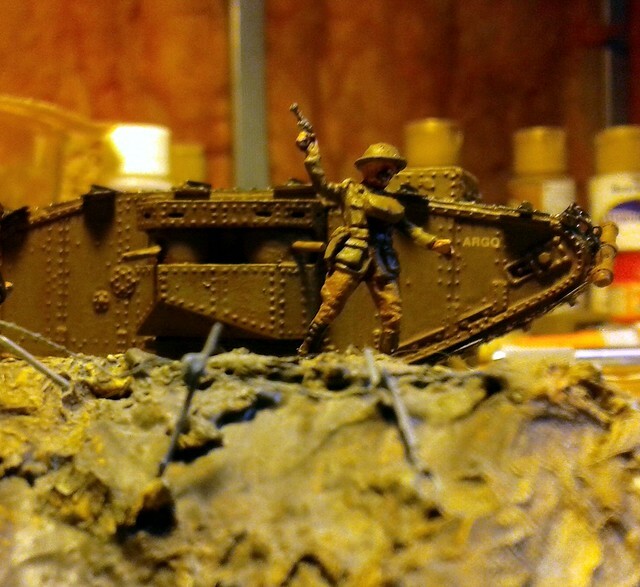 They are from Matador Models and date from a time before Airfix released their Mark I Female. Matador intended them to be an option for modelmakers to make a female instead of a male tank out of the Airfix kit, and so they are made in 1/76 scale. 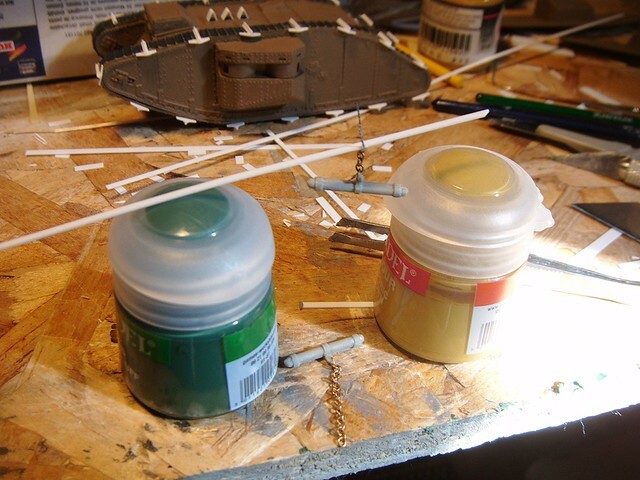 But some big dollops of gap-filling gel superglue, and some Green Stuff, took care of the size difference. 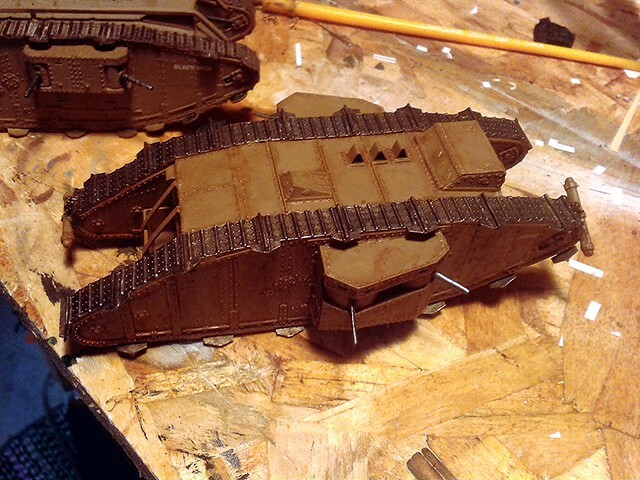 I see a lot of mud in this model's future! Oh, and I also got around to fixing the errors that Emhar made at the back of the roof. But I'm afraid to say, I ran out of time. I filled in some of the fine cracks and I made some grousers for the tracks - though I didn't make nearly enough yet. I used Hans' trick - thank you Hans. Well, I'd love to! 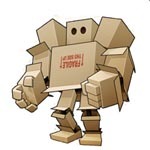 But where should I post; here or Work In Progress? This Group Build has finished, so maybe it should go in WIP? Thanks for your interest, gentlemen, and for allowing me to finish it here. I finished off the grousers for both tracks, added the bars holding the rear box, and fitted the "hats" over the exhaust outlets. 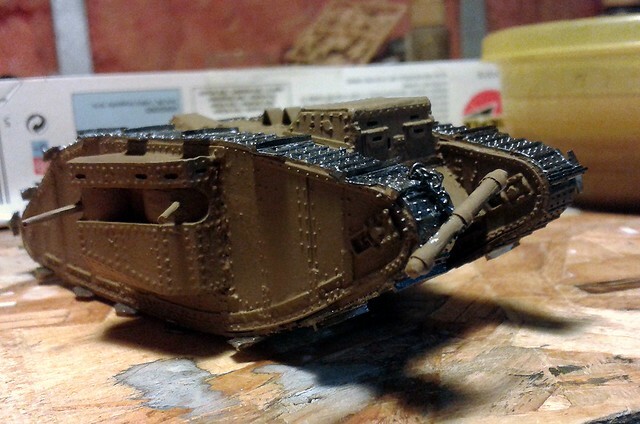 I still need to add some track torpedos and the Lewis machine guns. 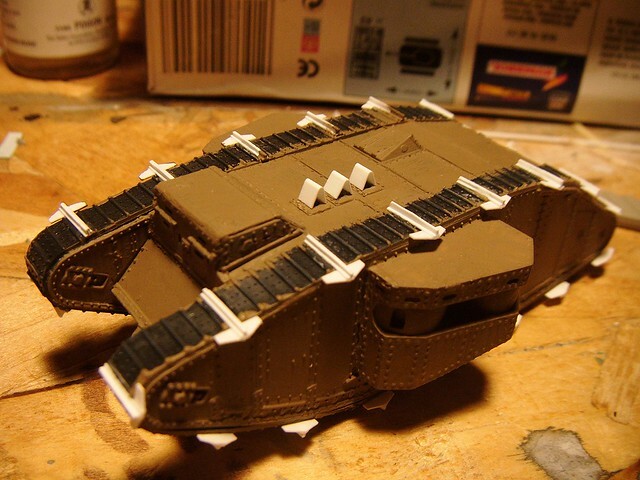 Oh, and paint, decals and weathering, of course! Made a couple of track torpedoes today, while the light was good, everybody else was out, and the muse was upon me! 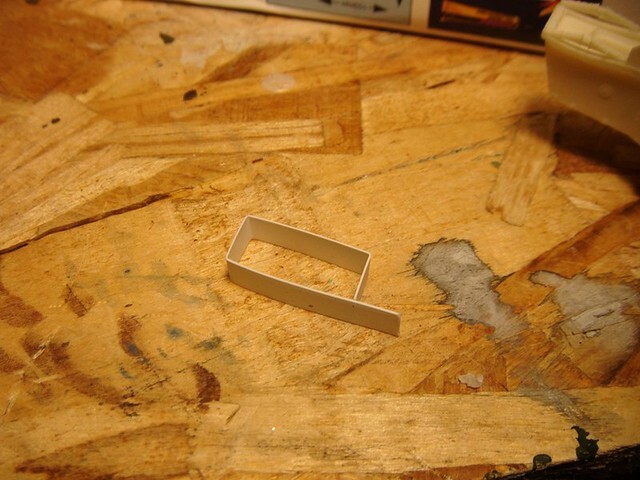 The resin part is from Matador Models and the rest is some fine chain from a model boat building shop, some wire, and some Evergreen plastic strip. Track torpedoes were used, along with grousers, in an attempt to get the tanks moving in churned up muddy ground. About a month after the Mark IV got to the battlefield (around about mid-1917), unditching beams and unditching rails appeared and the torpedoes were not used any more. 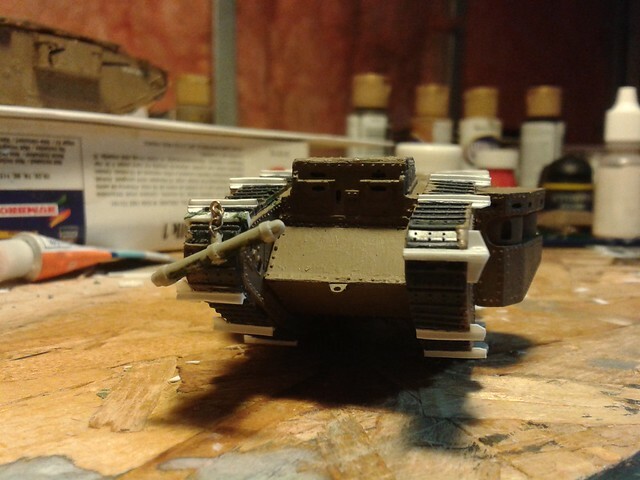 Just needs some Lewis Guns now. 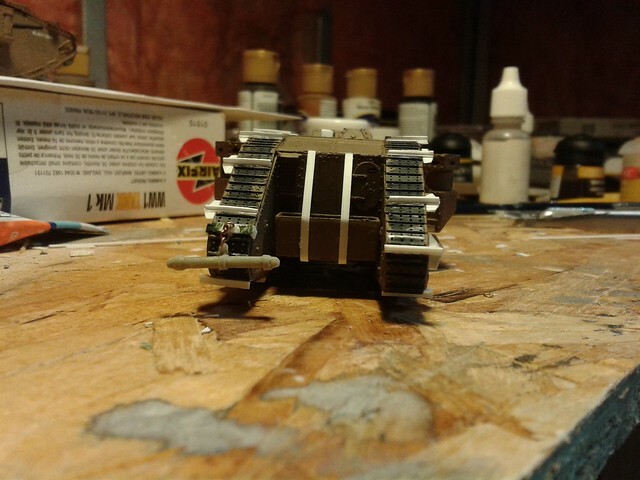 Lewis guns done, paint going on. As you can see, I am not a very good and careful painter! The Lewis guns are from Matador Models. They are not very good, being the wrong shape and length and having mould seam lines as well, but they are better than what I tried to make! The decals are from Skytrex and are years old. 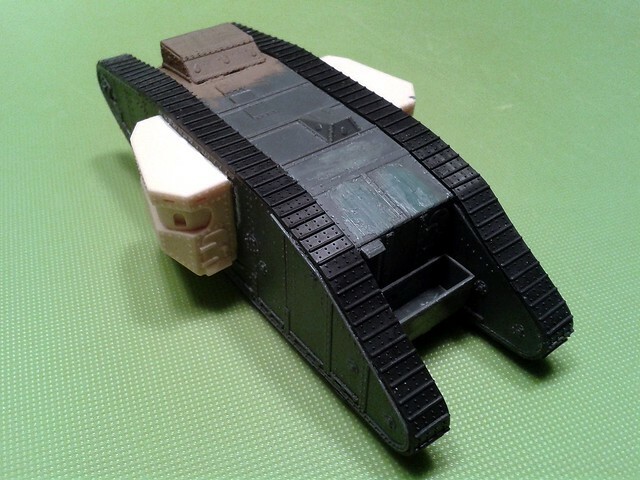 As far as I am aware, there was no Mark II tank called "Argo" but the name seems to fit; I can imagine a young officer, an erstwhile student of the classics, naming his bus, "Argo". It's also the name of the ship in one of my favourite films! The Skytrex decals did not have an "Argo" in them, I had to do some surgery to "Argosy". I put some gloss varnish on and let it dry. Then used Micro Sol to get the decal in place, and let that dry. Then another coat of gloss varnish. And that's where we are at in these photos. 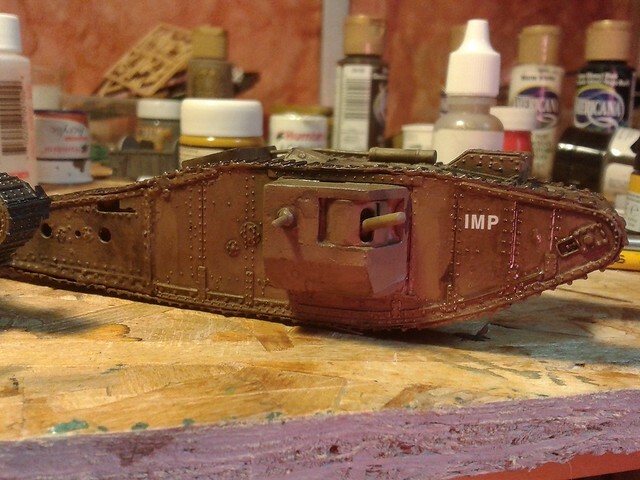 Tomorrow I will use some Testors Dullcote over the gloss varnish and then it's back to washing and weathering. I heard about the "pencil technique" from Alan Phillips on the Armourfast forum, where he says he uses it to do tracks; I thought it might work for gun barrels too. 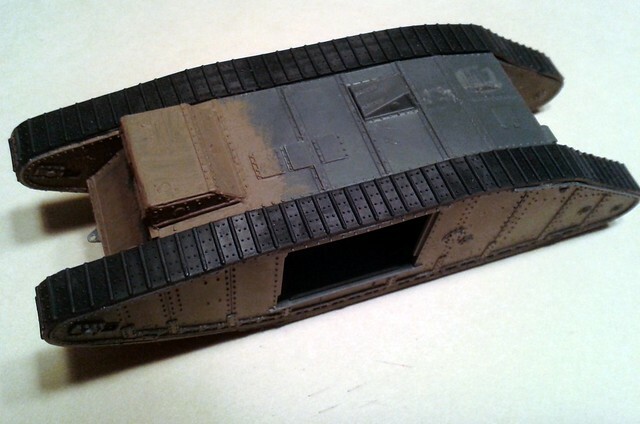 With my Mark II, Argo, I just need to add some mud, and I'd ideally like some shovels in the stowage box at the rear; these tanks ditched a lot and would need a lot of digging out (even under fire).